For birdwatchers, nothing quite compares to the visceral thrill of eyeing a rare breed of bird through a pair of binoculars. Especially after camping out an area for hours in the small hope of catching a glimpse. When it does happen, the moment is all to0 brief and there remains a desire to relive it time and time again. Fortunately, modern technology has come up with a solution that incorporates two devices in one; binoculars and a digital camera. With the two combined, not only can the user home in on far-off points of interest, they can also capture the moment for posterity with the quick press of a button. The utility of binoculars with cameras is not, however, restricted to birdwatching. They prove useful in a variety of settings including live sporting events in a stadium where it is impossible to view all the finer details of the action taking place with the naked eye. You can capture that decisive play that decides the game and gaze upon it for years to come, triggering a flood of memories. Other uses include whale watching, game spotting and general sightseeing. 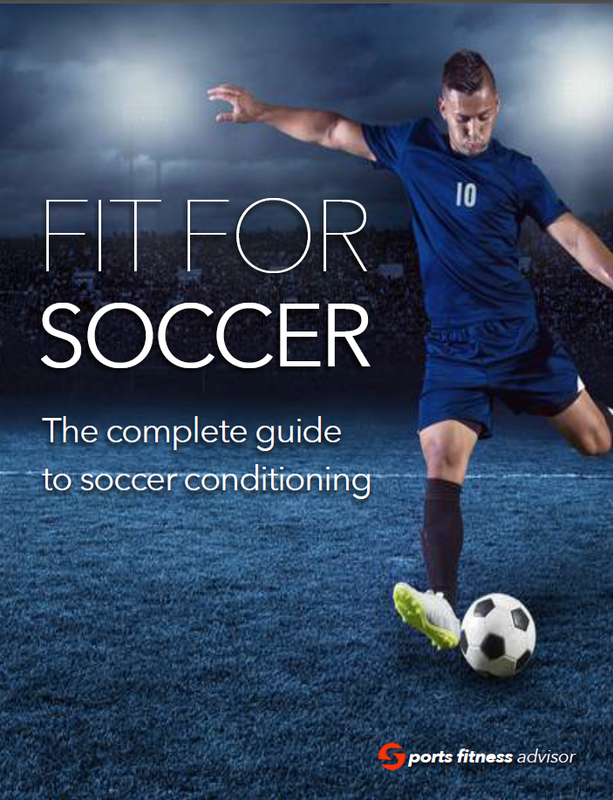 In this guide, we reveal our findings after scouring the market for the best products out there. Cost, value and features all come into play in our choices. We hope to make the act of buying binoculars with cameras somewhat easier. Binoculars as the name suggests, are a device that uses two telescopes to view objects at a distance. The telescopes are lined up parallel to one another and aimed in an identical direction. This means both eyes are able to see the targeted object as the naked eyes would, producing a uniform image. If the telescopes are not aligned correctly, the user sees two images rather than one. Inside the binoculars, a refractor lens or reflector mirror captures light then focuses on it. This magnifies the light into a perceptible circular image that is fully three-dimensional with depth of perception. Due to the way binoculars capture light, the image is often inverted. To counter this, a prism is incorporated between the objective and the viewpiece to rotate the image both horizontally and vertically for the viewer. 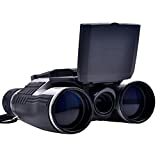 Binoculars with cameras are simply binoculars with a mounted built in camera that is able to photograph, and sometimes record, what is seen through the lens. The general concept is to reduce the many lost opportunities caused by birdwatchers fumbling around to grab their camera, only for their subject to fly away, never to be seen again. Magnification is commonly referred to as zoom and is measured in the format x the desired number, for example x7. Higher magnification results in a better ability to focus on distant focal points; they appear larger in the viewpiece and a more detailed picture can be captured by the camera. On most models, the magnification is adjustable as well with a range that usually starts at 0.X up to a much higher whole number, for example x0.8 to x10. Another point of consideration is whether the magnification process is digital or analogue. Analogue refers to the binoculars natural zooming function determined by the hardware parts that make up their inner viewing mechanism. Digital magnification technology’s relative infancy means the results are not as sharp as with an analogue zoom. We recommend keeping this in mind depending on your needs and whether image quality of highly magnified objects is a priority. Finally, it is worth noting that more magnification results in a reduced field of view and exaggerates the minimum close focusing distance. Put differently, the shortest distance at which you can comfortably focus on an object. This is measured in feet. If you are hoping to view relatively close up objects, then ensure the close focal distance is sufficiently small for your needs. It also intensifies the shake of an image requiring the user to be more steady with their hands. In addition, higher magnification requires more focus so you may find yourself using the focus adjustment a lot more to get the finer details of further points of interest. Aperture is the size of the objective, measured in mm, for example 32mm. The rule of thumb is that the more light binoculars are able to capture, the sharper the image and the more details are apparent. The size of the objective determines how much light can be captured. The larger the objective, the higher the cost and weight, but equally, the image quality is better and brighter. In general, we recommend getting binoculars with an objective size of at least 30mm. Anything lower and the weight/cost compromise negatively affects quality. Opt for a larger objective if you are going to use the binoculars in low light settings like at dawn and dusk or in heavy foliage and forests. Put simply, field of view is the width of image you are seeing through the viewpiece. Technically, it is the width of an area which can be viewed from a distance of one thousand yards, and is often measured in degrees, for example 5.5 degrees. A larger field of view makes finding targeted objects much easier, particularly if they are in movement like a flying bird or a running quarterback. In general, smaller fields of view produce sharper images and we recommend finding a compromise between the two features. As above, magnification proportionally decreases field of view so keep this in mind if you are tempted by a high magnification model. The exit pupil is the small circular hole in the viewpiece through which the magnified image is seen. Measured in millimeters, it appears larger when your eyes are brought up to the eyepieces. Diameter relates to the binoculars ability to capture light and determines how bright an image will appear, particularly in darker conditions. It is limited by the natural size of the pupil and therefore falls anywhere up to about 8mm, though we recommend anything above about 4mm or 5mm. The distance is essentially the space between the viewpiece and the exit pupil. As above, prisms are used to flip and rotate the image captured by the lens so that it appears the correct way up in the viewpiece. The quality of the image can vary greatly in terms of brightness and clarity based on the type of prism glass used. Without delving into too much detail, options range from the low cost borosilicate crown, or BK7, the very dense barium crown, BaK4, to fluoride ion, or FL. Price is the best indicator of the quality of the prism. Entry-level models tend to create slightly blurred edges and dark images. Megapixels measure the number of light capturing pixels on the digital camera of the device. It appears as X megapixels, 7.1 megapixels for example. Megapixels dictate the resolution of the camera and determine the quality of the images. More megapixels mean more detail. In general, higher megapixels translate into a higher price. LCD screens are mounted on the top front portion of the binoculars to allow the user to view the image they have just captured as well as adjust inbuilt digital parameters. Screen size is displayed in inches. Here, the choice is a matter of personal preference though the size of binoculars limits the size to somewhere in the region of one to two inches on most models. Certain models are able to record video, sometimes only short snippets in a variety of formats though generally AVI. It may also be possible to preview and playback videos via the LCD screen. An instant replay feature is also great if you forget to trigger the record button and an interesting bird suddenly appears. Some models allow you to access up to the last minute of footage. Look for HD capabilities and understand that quality varies greatly between models. We do ward off anybody who requires professional quality video footage because the cameras simply aren’t designed to capture the best video, mainly limited by the size of the devices and space to technology limitations. Internal memory varies between models and determines how many photos and videos can be stored. Check for memory card expansion slots and the maximum size they accommodate. You really don’t want to constantly be changing cards after taking only a few photos. The design of binoculars and notably the use of lenses and mirrors inevitably lead to a portion of the light to be reflected before it can even be magnified. Instead, you get a kind of visual reverberation of the light that leads to reduced clarity and blurs. This is due to the multiple layers that make up the internal parts of a pair of binoculars. To minimize this effect, various types of coatings are available to reduce light loss. They are usually fitted to prisms and the lenses for the best results. These range from layered versions to fluoride coating. The general rule to follow is coating creates sharper and brighter images. Price correlates directly with the degree of coating so more expensive models have better coating. Coated: a rudimentary form of coating that usually only covers one face of the lens. Phase-Correction: as the name suggest it corrects phase caused by colors on prisms. Multi-Coated: multiple layers are applied to the lens. Fully Coated: coating covers all the lens surfaces. Fully Multi-Coated: an amalgamation of the above two, whereby all lens surfaces are covered with multiple layers. Weight is all about comfort and how long you expect to carry the binoculars. Weight also has an effect on shake at high zoom levels. Most models aren’t excessively heavy so don’t let this put you off a model if all the other features fit the bill. These include night vision, waterproofing (with anti fogging properties, sealed binoculars that keep dust and debris at bay) and shock proofing measures like rubber coating, tripod fitting adjuster, and image-stabilization technology to minimize the natural movement of the human hand, notably at higher zoom levels. Also make sure the binoculars have interpupillary distance adjustments. In other words, the ability to adjust the gap between the two viewpieces. People naturally have a different distance between both eyes due to normal variations in face structure. The ability to adapt a pair of binoculars is of utmost importance for the eyes to accurately see an image. Buying a low cost pair of binoculars with a camera is not recommended and we suggest you spend in the region of at least one hundred dollars to get a decent product. However, if you are really strapped for cash and desperately need one, we would point you in the direction of the Bushnell 10x25 ImageView. These are by no means good binoculars and they represent the best among the worst options on the market. The ImageView is equipped with a lens capable of x10 magnification, which is more than adequate and doesn’t affect the field of vision too severely. There is also a 8x digital imaging magnification though our thoughts on these types of zoom are explained above. The objective size is 25mm so medium sized. Consequently, they are not powerful enough for anything other than amateur birdwatching. The field of view is limited at just 290 feet and the close focus a rather decent 12 feet. Unsurprisingly the prism is BK7 and the exit pupil 2.5mm. In terms of the camera, there is no mention in the official documentation of the megapixel value, which is rather worrying. Instead, the resolution is noted as 640x480. The internal memory is a minuscule 8mb, though the ImageView can accommodate SD cards up to 1GB. These specifications aren’t anything to write home about and as expected the picture quality is dull and lacks brightness. Powered by two AAA batteries, the ImageView weighs a respectable 10 ounces and ships with a tripod socket, USB port/cable for photo transfer and remote shutter cable. Overall, we weren’t impressed by the ImageView. That being said it scored slightly higher than rivals in the budget price range and this explains its appearance on our list. Once again, we caution you against buying entry-level products and do recommend spending more to get a product worth the money. 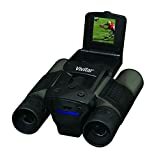 Also in the lowest price bracket is the Vivitar VIV-CV-1225V 8MP 2-in-1 Binoculars and Digital Camera. Similarly to the Bushnell, you get what you pay for and we can’t recommend it for anyone who needs high quality images. Magnification is x12 and objective size 25mm, so limited light that gets worse as you zoom in. The field of view is small at 4.6 degree. The camera is a decent 8 megapixels though and is the saving grace of this product. The in-built memory can store up to 160 images and you can easily add memory cards 32mb and higher. The LCD is 1.44 inches and allows on the spot playback. The binoculars even ship with editing software so you can work the photos once you get home. The design is straightforward with a set of buttons that make taking pictures very simple with the press of a button. Power is sourced from AA batteries. Weight is 1.13 pounds. The binoculars include a tripod socket and are shipped with a carrying case, user manual, and shoulder strap. As with the Brushnell, we can’t recommend it in good faith, but it should work well for those who are realistic about its capabilities. The cost is clearly attractive and dampens some of the lesser features of the Vivitar. If you are willing to spend a little more money, you enter a category with a number of functional models. 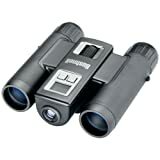 The best among them is the PYRUS 12x32 Binoculars With Camera. As the name suggests it has x12 magnification and an objective size of 32mm. With these specification we delve into the realm of decent light capture and the pictures show signs of this with decent, but not exceptional, clarity. The exit pupil has a diameter of 3.8mm and provides decent vision through the viewpiece. The minimum focus is a rather limited eight meters, though we understand that most users want the binoculars for distance viewing so this shouldn’t be an issue. The camera is equipped with a two inch LCD display that works when the lid is opened and shuts off when closed. It accepts SD cards up to 32GB, providing ample storage for numerous pictures. Unfortunately, the manufacturer info doesn’t provide a megapixel value, simply a recording value of 1080p HD. It is hard to guess the exact number, though we estimate it at no more than 1.3 megapixels. Considering the model as a whole, we weren’t impressed and we weren’t disappointed. The images aren’t the best quality, yet are clear enough for objects to appear visibly. There is some blur and aberrations that appear on the pictures though. If you are looking for details, forgo this model. As with the ImageView, we can’t stress how crucial it is to spend more to get a reasonable pair of binoculars with a camera. The Pyrus binoculars ship with a USB cable, hands-free neck strap, tripod socket, a lens cloth and a useful user manual. Our pick of the lot in the high end range is the Sony DEV-50V/B Digital recording Binoculars, with a price significantly higher than other models, though you are getting top of the line binoculars. The DEV-5 has magnification that ranges from 0.8x to 12x for pictures which can be enhanced to x25 with the inbuilt digital zoom and video can be filmed with magnification from x0.5 to x25, giving you a wide margin of zoom options. The lens is 35mm so gets ample light and captures high quality pictures and videos. There’s a digital auto focus feature called Hyper Gain that shines when following birds in flight or fast sports action, and image stabilization coined Optical SteadyShot with Active Mode that minimizes blur caused by shaking even at high magnification. The viewfinders are OLED XGA and have a field of view of 36.9° when focused on an area 1000 yards away, coupled with interpupillary adjustment ranging from 55mm to 75mm which should fit most people. The two wide angle G Lenses capture separate images for each eye. These are then merged together to create detailed reproductions with vibrant colors and sharp details. The minimum focus varies depending on what mode you have enabled. The modes are 2D wide mode, 2D tele mode, 2D tele macro mode, 3D wide mode and 3D tele mode. The focus runs from as close 0.4 inches in 2D and all the way to 79 inches in 3D. This gives a wide variety of uses and options from the very close all the way to the distant and everything in between. The 3D mode captures stereoscopic video that can be played back on 3D TVs with precise details and depth of field. A switch allows you to alternate between the modes. The camera itself is downright sublime. It captures pictures at up to 20.4 megapixels with a resolution of 6016x3384 and videos up to 1920x1080 in true high definition. The quality is simply astounding and there’s even an inbuilt two channel microphone to capture ambient sound. There’s also a dual function jack which can house headphones as well as a wired external microphone. You can slot in an array of memory card types, including SD cards. As expected, the build itself is bulky at 1.7 pounds in comparison with competitor models in order to house all that power. A quick record button appears on top of both viewfinders for easy, off the cuff recording and a convenient manual focus control that is easy to access. The binoculars are layered with ergonomic grip and elastomer for maximum hold. The lithium-ion battery is rechargeable, runs for up to three hours with a handy indicator displaying the battery charge in the viewfinder. The kit also includes an adapter, and ships with a USB cable, eyecups, a neck strap, a finder cap, a lens cover and a carrying case. There’s also an integrated GPS receiver than can tag images based on where they were taken. Overall, the quality of the images is extremely high and the binoculars are powerful, though each of these doesn’t meet the standard of their individual counterparts. In terms of a two in one device, the DEV-50 is by far the best on the market and we can’t recommend it enough. The price is prohibitive and we would only recommend forking out such a large sum if you are serious about capturing images in high quality or are a dedicated bird watcher. 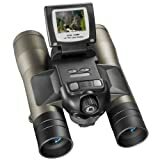 Next up, we have the CamKing FS608 Digital Camera Binoculars, which are ideal for birdwatching. The FS608 magnifies up to x12 and has an objective size of 32mm, both measurements are within respectable limits for clear images. The field of vision sits at a reasonable 5.5 degrees/96 meters per 1000 meters. Minimum focus is four meters and the pupil diameter 2.08, leaning too much towards the low side for our liking, but not a deal breaker. The camera supports 1.3 megapixels with a maximum resolution for both images and video of 1280x960. The LCD is two inches and has quick controls for fast navigation between settings. It doesn’t ship with a memory card and accepts capacities up to 32GB. The battery is lithium-ion. It ships with a tripod support, charging cable and a user manual. The FS608 works best as a birdwatching accessory because of the good balance between magnification and aperture. Objects appear clear and bright in the viewpiece. The video isn’t as stunning as the DEV-50, but is decent enough for clips to remind you of rare sightings or as a visual remember when you want to conduct research on a specific bird. The 0.97 pound weight is also conducive to long watching sessions and the binoculars are easily lifted if you happen to suddenly see an interesting focal point in the distance. For darker environments, we felt that the Barska 8x32 Binocular & Built-In 8.0 MP Digital Camera was the most suited among its peers. It offers up to x8 magnification, as well as a x4 digital zoom, and an objective size of 32mm. The sizable aperture means light is captured well and this translates into a crisper and brighter image perfect for dawn/dusk excursions and even sport of events happening in the evening. The central focus dial is also very useful for fine tuning details on objects in preparation for taking a photo. The field of view stands at 330 feet, a surprisingly large area given the price. Complimenting this is a good sized 4mm exit pupil and minimum focal point of about 16 feet. In addition, the Barska has multi-coated lenses to reduce reflection and it really shows in the brightness when looking through the viewpiece. In darker settings, an automatic CMOS image sensor adapts to shifting light levels for increased image quality. The camera offers up to 8 megapixels, a 1.5 inch TFT color LCD display with a menu to browse images and change digital settings with ease. It accepts normal SD cards. The USB port allows you to transfer images and video to other devices thanks to the supplied USB cable. Additionally, it ships with photo editing software, a lens cloth, a useful carrying case and a one-year warranty for good measure. The Barska is also relatively light at only 13.76 ounces. The light friendly features are what make the Barska stand out for us and we found that it performed well in a variety of different settings. We feel that other models produced much darker images in similar situations. Overall, a good product with a warranted set of features that make the price very attractive.